Today is Martin Luther King, Jr. Day. I wrote about MLK day last year and suggest taking a look at that post, too. There isn’t a lot I want to say today, but I do want to point to a speech by Dr. King. I couldn’t find this speech on YouTube, but there is some audio of the speech (but it’s only the final paragraph). Nonetheless, I thought the speech, especially in its context (Vietnam War, Civil Rights Movement, etc. ), is quite powerful. Moreover, I think the words that Dr. King spoke are applicable to some of the issues that are facing the world today. I’m speaking particularly to the all-time lows in US Congressional approval and the continued unrest in the EU. 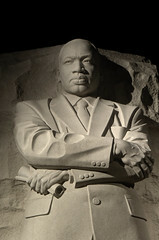 This entry was posted in History, Wisdom and tagged Martin Luther King Jr, Martin Luther King Jr Day, Quotes. Bookmark the permalink.